I want to tell you that you have kept my spirits high. Why? Long story short. My rescue puppy had contracted Parvo (a long 6 days at our vet hospital and a wonderful veterinarian). I would see your comics daily. They bring a warm feeling to my heart and still do. Our puppy, Jessie, is now home recovering nicely. Thank you for keeping hope alive seeing your comics. ❤️ A True Fan. As yoga practicing, dog loving (and rescuing) household we LOVE your art. I especially LOVE my Red and Howling mug. I enjoy your cartoons. They reflect my life. I have rescued seniors for many years. I also have Patio, a semi feral cat, who adopted my patio a few years ago. He is fine with my seniors. He can come in anytime and stay. Presently I have three senior dogs. I recently placed an order for some stickers and I wanted to thank you so much for including two extra ones !!! It was such a nice surprise and so very generous of you. I love everything you do. It brings a smile to my face every time I see one of your drawings. Thank you so much !! I love your paintings, I have 8 of them. I have bought other things to. When you have the love of a dog you have every thing. thank you. Love to read your cartoons! Thank you for your newsletter. We have three rescues...all terriers. The latest one is a hoot. His name is Clancy and he does not have any eyes. He does not know this. He gets around just fine. 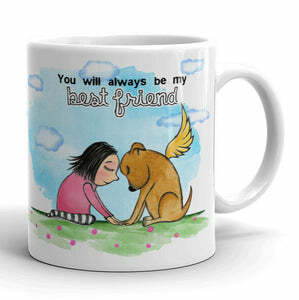 Only one who has loved an animal be it dog, cat or other can relate to these beautiful cartoons. I LOVE it! Dogs have always been a girls most reliable friend! Love your love for animals.